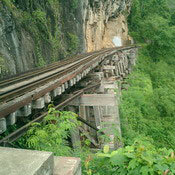 The Death Railway is a section of the Thai-Burma line which was built to support the Japanese occupation of Burma during World War 2. The Wang Po Viaduct is a wooden lattice structure that supports the railway line around a cliff wall with the River Kwai below and is quite spectacular. 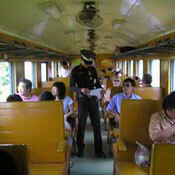 The twice-daily train service runs from Thonburi to Nam Tok station, which is the end of the line now. It is a slow trip as the third class train stops at every little station on the way and the scenery is not so interesting. 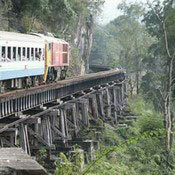 However, once the train arrives in Kanchanaburi, everything changes. First off, the train crosses the Bridge over the River Kwai and then follows the river providing some spectacular scenery. The highlight of course, is the train crawling around the Wang Pho viaduct and it will allow you time to reflect on the 100,000 conscripted Asian labourers and 16,000 Allied POWs who died during its construction. 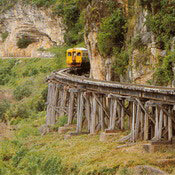 The two main viaducts followed the bottom of the cliff for some distance. A ledge had to be carved out of the cliff face to form a base for the bridge and embankment construction. Near the station is the Krasae Cave, which houses a fine Buddha figure and offers a spectacular view over the River Kwai. This cave was used by the POWs as a hospital during the construction of the railway.